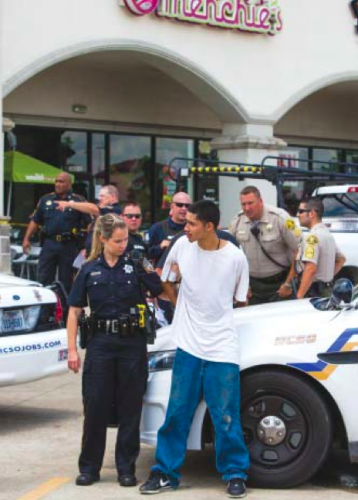 HOUSTON (May 29) – One man was shot and killed, another arrested after gunfire was exchanged in the parking lot of a shopping center in Northeast Harris County. According to HCSO reports, a 28-year-old Marine veteran was eating at a sandwich shop next door to the GameStop along Wallisville Road near the East Sam Houston Tollway last Thursday around 12:30 p.m. when he saw two men get out of their car and put on bandanas on their faces. The Marine Veteran, whose name was not released, saw the two men enter the store, deputies said. Then, the veteran went to his truck to get his gun. He waited outside for the robbers. One of the suspects pointed a gun at the veteran who fearing for his life exchanged gunfire with the robber. The robber attempted to drive away on his vehicle but he was struck and killed as he was sitting inside the car; the second suspect ran when the shooting started. The second suspect was caught moments later close to a fast food restaurant. Nearby schools Aguirre Junior High School and Harvey Brown Elementary school in Channelview ISD and North Shore Middle and North Shore High School were locked down while deputies were searching for the second suspect. Deputies said the veteran who has a concealed handgun license was not hurt. He was questioned by homocide detectives and released. The alleged robbers are only described as Hispanic males in their 20s.